When I started this blog many years ago, I had big, creative ideas about what I would like to write about. I found, though, that at that particular time in my life, I just didn’t have the time to devote to it and after a few years I packed it in. The site has, obviously, remained and I have been surprised through the years to find that readers still come across this article and share their thoughts or express a desire to buy the clock. So, an update for all readers. My dad passed away several years ago, and I don’t plan to ever part with the clock. It was a rarity even when I bought it so, unfortunately, I have no idea where you might be able to find one today. Thanks for sharing your memories. I apologize to anyone whose enquiry I may have missed over the years. Clock: noun – An instrument other than a watch for measuring or indicating time, especially a mechanical or electronic device having a numbered dial and moving hands or a digital display. Clocks make great gifts. They come in almost every imaginable size and style, represent a huge number of hobbies and interests, are available in prices to suit every budget and, as an extra bonus, are even useful. I love it on those rare occasions when I find a gift that is so perfect for someone, it might as well have their name on it. That happened to me well over twenty years ago when I saw a timepiece in the window of a little clock shop that instantly brought my dad to mind. 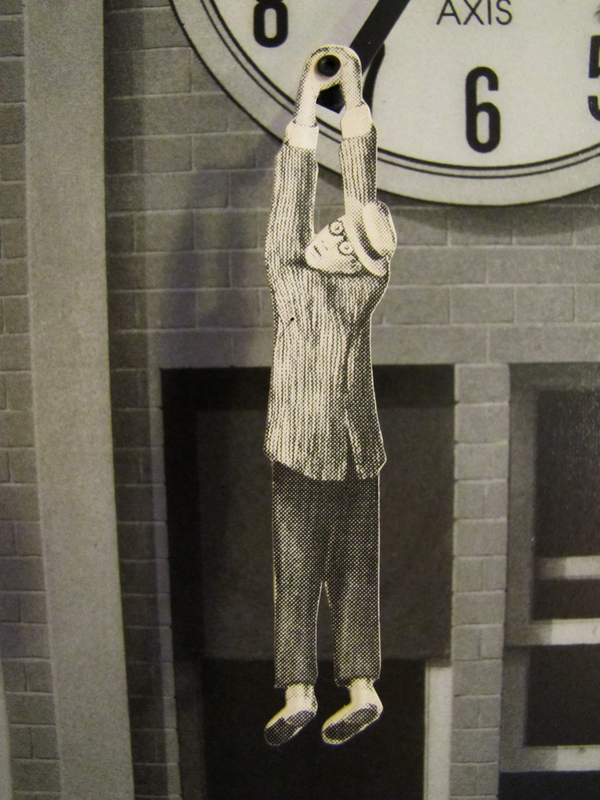 The clock had a figure of silent film star Harold Lloyd hanging from the minute hand, recreating the real Lloyd’s role in the 1923 silent film classic Safety Last!, a film my dad loved. 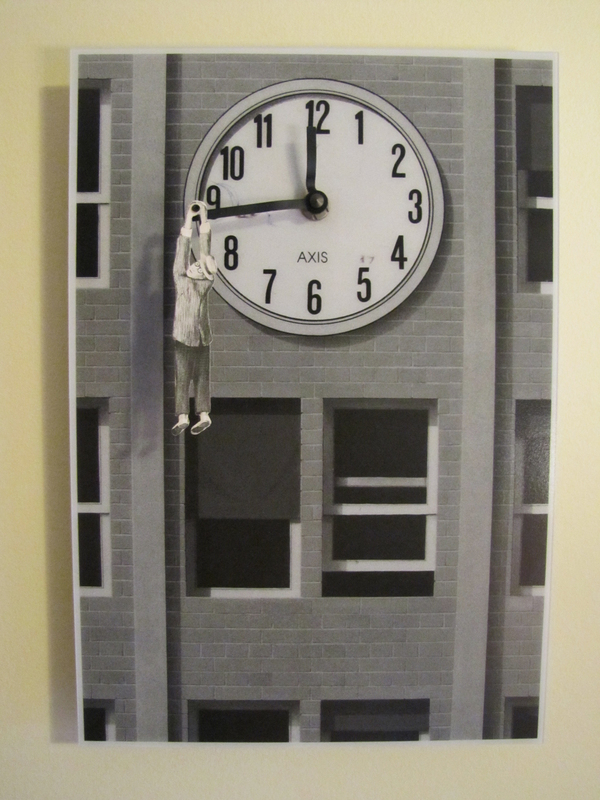 I asked how much the Harold Lloyd clock in the window was and I recall that the owner was impressed by my knowledge of Lloyd, as most people thought the clock figure was the better known actor Buster Keaton. The clock cost more than I could afford then, but from the moment I laid eyes on it I knew I was going to get it for dad, so my sister and I shared the cost and gave it as a gift from both of us. It was money well spent, because all these years later, Harold is still hanging on and circling the clock face every hour. I wonder how many times dad had to explain the significance of the clock to visitors? 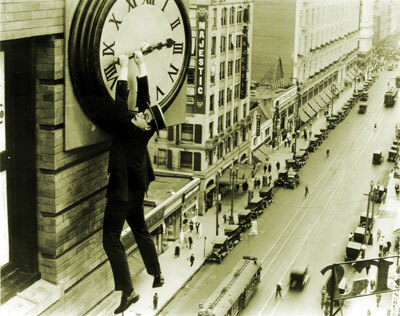 I suspect it was often, because although the still shots of Lloyd hanging from the clock twelve stories above the city streets are some of the best known photos from silent films, not many people have seen the movie. It stars Harold as The Boy who promises The Girl (Mildred Davis, Lloyd’s real-life wife) that he will go to the city, make good and send for her. Naturally, things don’t go as well as he would have liked. For everyone’s enjoyment, but especially for those who have seen the clock and wondered about the film, here is a clip of Harold Lloyd in Safety Last! Jeez, that’s terrifying. Nice post, though! I’ve always liked that clock. I bought mine 30 years ago in a cute whimsical shop in my hometown of San Mateo, California. Heard how only few were made.